Games are always with what many have their first introduction to computers, but the Gaming industry has evolved from console over the decades, and with present day gaming consoles and some PC Games come with default support to gaming devices like Gaming Wheels and Joysticks which improve the gaming experience. But most users are content with the keyboard experience,but that’s just untill one experiences a gaming wheel for Racing Games, incase you don’t have any plans of buying a Gaming Wheel then here’s a alternative. 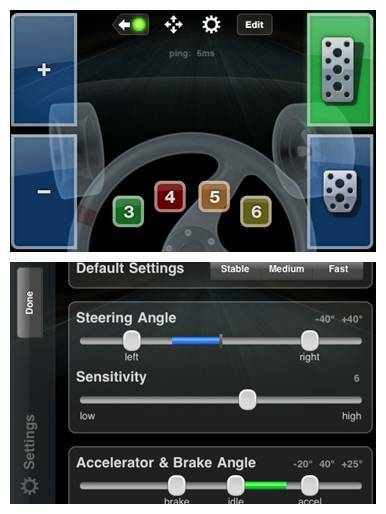 MungoGamer is a free iPhone and iPad app that makes use of the device Motion Sensor capability to use it as wireless motion controller for PC and Mac Games.It lets you have more control over the games from iPhone and iPad with Analog control, tunable tilt steering, tilt accelerator and brake plus an editable button layout in any game that supports USB input devices. The first thing that you need is the Server Software that needs to be installed on the machine where the games is installed and to which you need you iPhone or iPad to connect with and play. Next make sure your iPhone or iPad is connected to a WiFi Network to which also the system on which the game is installed.If the computer and iPhone are both on the same local network, MungoGamer will see your computer and simply selecting it from the list is all you need to do. MungoGamer will reconnect automatically when started.If Bonjour is installed then connecting the system and iPhone or iPad is easier by names, else you need to know the IP Address. Updates for MungoGamer are on the way. I’m looking forward to using the Gyro in the iPhone 4 and adding features to support other types of games before too long. unable to download this app from UK & US Store?